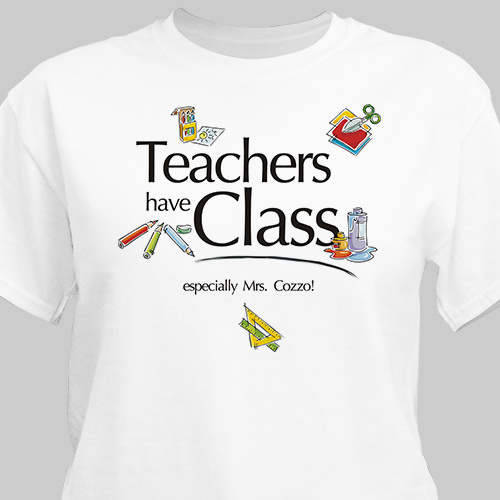 Your child's teacher will look great and feel great in this comfortable customized Teacher T-shirt which makes a perfect personalized teacher gift. Our Personalized T-shirt is available on our premium white 100% cotton T-Shirt, machine washable in adult sizes S-3XL. Includes FREE Personalization! Personalize your Teacher T-shirt with any name. Shop Personalized Gifts For Teachers Today! Our Personalized Teacher Gifts make great appreciation gifts for teachers of any Student. Get your Personalized Teacher Gift today & Say Thank you for the wonderful job. And for even more thoughtful ideas, shop personalized gifts for other occasions year round today!